You better not shout�you better not cry�you better not pout�we're telling you why! A Great Radio Christmas is coming to town! Pour yourself an egg nog, break out the ribbon candy, and tune in for a whole stocking-full of radio favorites celebrating the holiday season. These classic broadcasts bring you lots of laughs, lots of heart, and even a wintry dash of thrills, mystery, and adventure! From Chester A. Riley to Sgt. 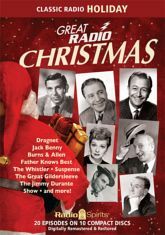 Joe Friday, radio's legends are waiting at your Christmas fireside!